I first heard 'Ballade pour Adeline' on one of those cheap compilation LP's that is half filled with great hits and half with a sort of throwaway track. Except this instrumental piece on piano was not really a throwaway track, albeit slightly cheesy. 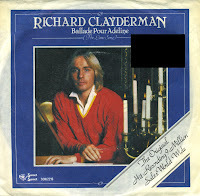 Richard Clayderman was born as Philippe Pagés on December 28, 1953 in Paris, France. He started playing the piano from a very young age. At 23 years old, he was auditioned by Paul de Senneville and Olivier Toussaint to record the gentle piano ballad. Toussaint commented on him winning the auditions: 'He was an interesting musician with a soft touch and good technique. And he looked good, too'. The single was the start of a successful career that lasts until today. It reached number 32 in the Dutch Top 40 and charted all over Europe.